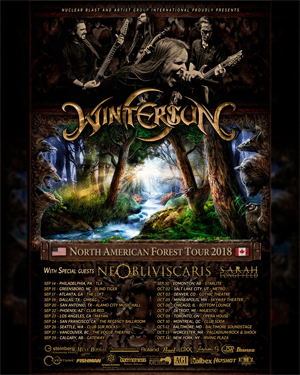 Epic metallers WINTERSUN will return to North America this September for a headlining tour in support of their latest album, The Forest Seasons. Joining them are the Australian progressive, extreme metal powerhouse NE OBLIVISCARIS and guitar prodigy SARAH LONGFIELD. "United States of America and Canada! We are extremely excited to announce North American Forest Tour 2018!!! It's been a while since we last saw you guys during our successful North American tours in 2012 and 2013, which you guys made very special. Now we are finally coming back to play for you with a new killer show this September - October 2018! This tour will be an epic and a rare treat for our North American fans. "We are also stoked to have two really strong supports with us on this tour: NE OBLIVISCARIS and SARAH LONGFIELD. So join the party! Let's have some fun and let's rock together! Please share this news!? Tickets will be available this Friday on June 8th. Make sure to check our Facebook on Friday and click the notifications ON, so you don't miss the tickets launch."